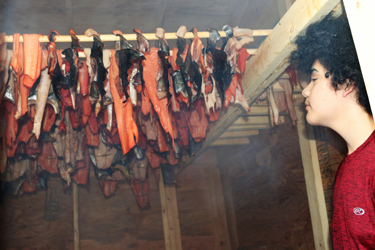 Two students and three staff from ‘Na Aksa Gyilak’yoo School blow eagle down to bless a new smokehouse. The smokehouse is used to preserve food such as eulachon, a traditionally important fish. In the background, two media arts students record the event, and a once-dry creek bed teems with water. In the midst of cultural revitalization program for First Nations students near Terrace, B.C., a dry, trash-ridden creek bed was transformed into a stream of fresh mountain run-off. 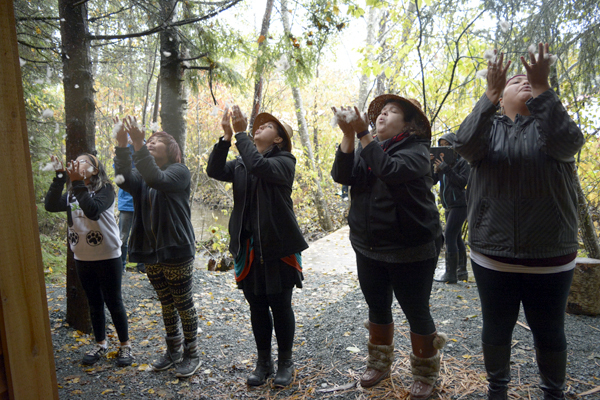 As part of the program funded in part by the Marine Plan Partnership (MaPP), students from ‘Na Aksa Gyilak’yoo School in Kitsumkalum, B.C., cleared garbage from the creek bed next to their school and led a traditional blessing of a nearby new smokehouse. Immediately following the blessing, a surge of water came down from the mountains, recalled school principal Colleen Austin. She said water filled the creek that empties into the Skeena River, one of B.C.’s major salmon migration routes. There had never been significant water in ‘Na Aksa Gyilak’yoo Creek in the 14 years she’s been at the school, Austin said. People used to hang out in the forest next to it, she said, and the rocky bed was strewn with litter. “We believe, and we’ve always maintained, that when we respect the land, the water, the air, the trees, and everything around us, that we will be blessed,” said Austin, when asked how she explained the creek’s revival. Austin, whose Tsimshian name is ‘Wii Goot, which means Big Heart, said the creek continued to run with water for several months, and despite being dry in October 2018, she believes the creek is likely to run again, and one day may be viable enough for salmon to spawn up it, as they traditionally did before the area became polluted. Sixty students from the school, ranging from kindergartners to Grade 12, participated in the Youth Cultural Revitalization Program, a $10,000 project funded by MaPP. The students’ backgrounds included Tsimshian, Nisga’a, Haida, and several other First Nations ancestries. The program was divided into four seasonal units, and included lessons on environmental stewardship and Sm’algyax, a critically endangered Tsimshian language. The school’s language co-ordinator, Mique’l Dangeli, who is fluent in Sm’algyax, led the programming, with others, including Nisga’a elder Larry Derrick, and John Blumhagen, a Tsimshian education assistant at the school. The first unit of study in the summer of 2017 focused on salmon, including the decline of local species with environmental changes, how to ensure the return of salmon, as well as its cultural significance. 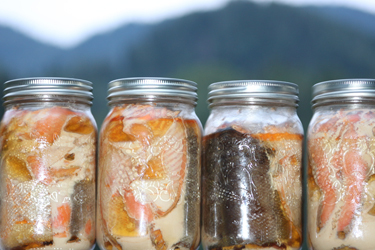 Students fished for salmon on the Skeena River, and cleaned, filleted, and jarred the fish. The second unit of study, in October 2017, was centred on the school’s recently built smokehouse, where food is traditionally preserved. The students cleared debris from the woods around the smokehouse and from the adjacent then-dry creek bed. They learned how to lead a blessing of the smokehouse, including with singing, dancing, and traditional uses of cedar branches, eagle down, and fire. About 90 members of the school’s larger community, including parents, grandparents, teachers, and local residents joined the event. The third unit, in January and February of 2018, focused on Tsimshian and Nisga’a astronomy, including reading the relationship between ocean tides and the position of the moon to predict a season’s bounty. 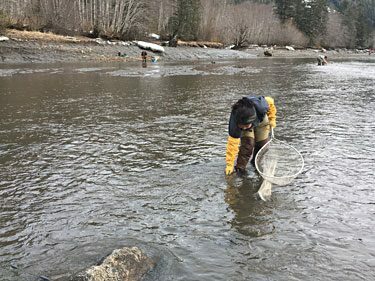 And, in March of 2018, students dip-netted in the Skeena River for eulachon, oily smelt that are about the length of one’s hand and traditionally vital to coastal First Nations. Eulachon populations have declined coast-wide, and are listed as a species of ‘special concern’. While the students were not successful catching them, they received some as a gift and learned how to smoke the fish in the school’s smokehouse. “The students loved being part of this project,” Austin said, noting that it helped build mentorship between students of different ages, build skills, and it connected students to their elders. She said students who may have run ATVs over the forest or thrown litter on the ground, are now working with elders to pick tea and berries, clean fish, and properly dispose of fish remains. “They wanted more,” Austin said of the students in the program, who comprised most of the student body of ‘Na Aksa Gyilak’yoo School. 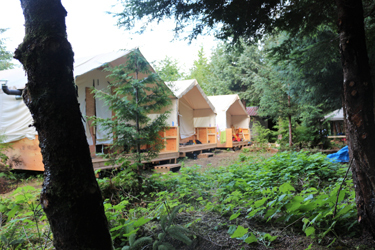 A new camping area was cleared and platforms built for the 2017 Haisla Cultural Camp. Photo credit: Brenda Bouzane. Located just half an hour from Kitimat, Weewanie Hot Springs Park is a completely different world than most of us inhabit. Accessible only by water, it is a remote wilderness destination where Xbox and iPads know no purpose. It was also home to 17 Haisla youth for 10 days last summer as they participated in the Haisla Nation’s revived cultural camp. 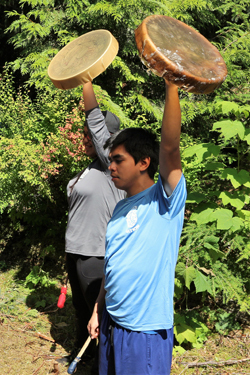 The focus of the camp, which was made possible by the Haisla Nation Council and funded in part by MaPP, was to teach participants about Haisla culture and to be respectful of Haisla resources. MaPP’s North Coast Marine Plan encourages capacity building in First Nations and local communities. An important first step for greater participation in stewardship, monitoring and enforcement, and economic development activities is to teach youth the skills they need in order to participate effectively and contribute to sustainable development in their communities. Bea Wilson teaching the youth how to cut salmon in a way that none of the fish is wasted. Photo credit: Brenda Bouzane. 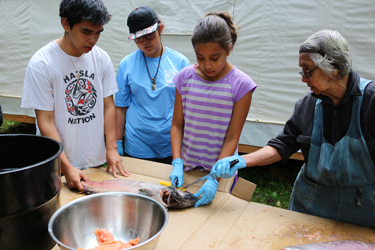 Each day participants learned traditional practices such as canoeing, crab fishing and long lining for halibut. 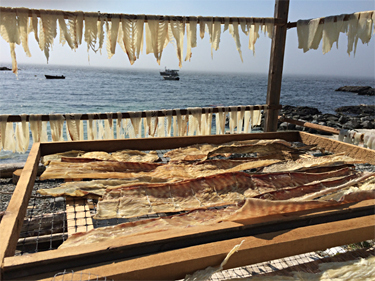 They processed fish and ate traditional foods. Daily hikes allowed for exploration including along hereditary trap lines. The community cultural coordinator with the Haisla Nation gave a language lesson while another guest taught cedar weaving. 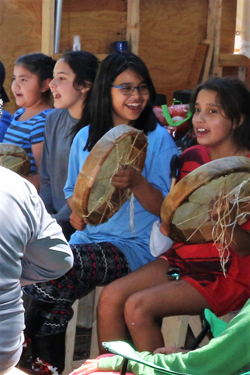 Another camp highlight was a visit from Shelley Bolton and Terry Nyce from the Spirit of Kitlope dance group, who taught the youth traditional drumming songs and dances. Guests from Spirit of the Kitlope dance group taught the youth traditional drumming songs. Photo credit: Brenda Bouzane. The youth were empowered by learning about their culture. Photo credit: Brenda Bouzane. 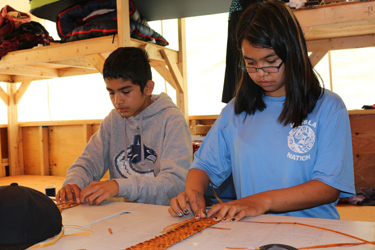 Youth learned how to weave cedar. Photo credit: Brenda Bouzane. Hanging salmon in the smokehouse. Youth made half-dried salmon and t’los, a fish jerky. Photo credit: Brenda Bouzane. Some of the canned salmon the youth prepared. Photo credit: Brenda Bouzane. 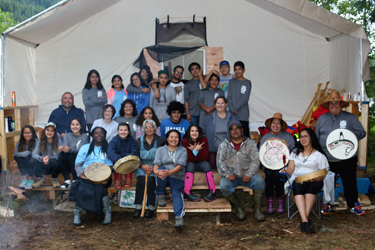 A group shot from the Haisla Youth Camp, showing the youth, support staff, and members of the Spirit of Kitlope dance group. Photo credit: Brenda Bouzane. 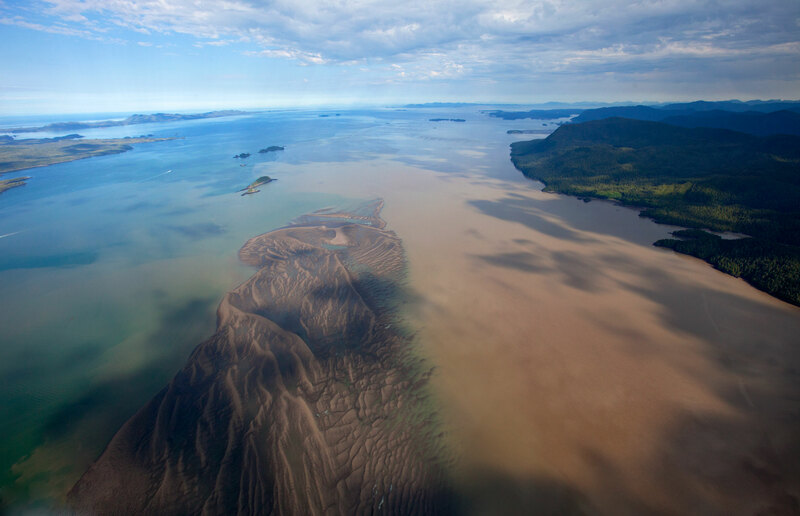 Tidal mudflats and shallow intertidal passages in the Skeena Estuary provide vital habitat for fish and birds. Photo credit: Brian Huntington. Originating high in the coastal mountains of northwestern British Columbia, the Skeena is the second largest river in the province and one of the world’s longest undammed waterways. It winds 610 kilometres from its headwaters to its rich estuary near Prince Rupert. The mouth of the Skeena is a world onto itself. 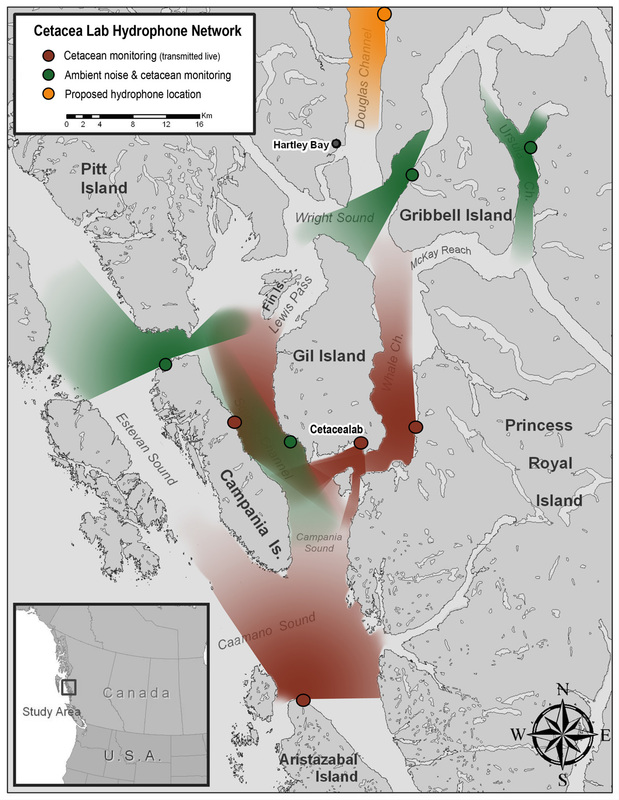 Unlike most estuaries, the Skeena does not have a single distinct intertidal delta. Instead, sediments from the river are deposited in shoals along the lower river and channels that connect the estuary to the open ocean. The result: a region of extensive mudflats and shallow intertidal passages. Here, eelgrass beds and kelp forests so vital to the health of other species flourish. The area supports some of the largest fish populations on the coast and it is a critical waterfowl habitat. 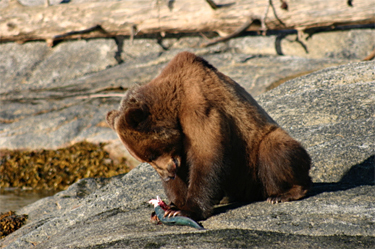 All Skeena salmon spend part of their life in the estuary and depend on its health as juveniles and as returning adults. The Skeena Mouth is important to the region’s First Nations and includes ancient village sites, harvesting areas and sacred places. With its natural beauty and abundant wildlife, it is also a great spot for ecotourism. First Nations harvesting eulachon on the Skeena River. Photo credit: Penny White. To help protect this “super habitat,” the Province of British Columbia and First Nations in the North Coast plan area, represented by the North Coast-Skeena First Nations Stewardship Society (NCSFNSS), identified the mouth of the Skeena River as a protection management zone (PMZ). Land use decisions consistent with the recommendations in the North Coast Marine Plan will help ensure the sustainability of this unusually productive and complex ecosystem that is so important for a number of culturally, recreationally and economically important marine species. One such species in particular has an important role in nature and culture: eulachon. 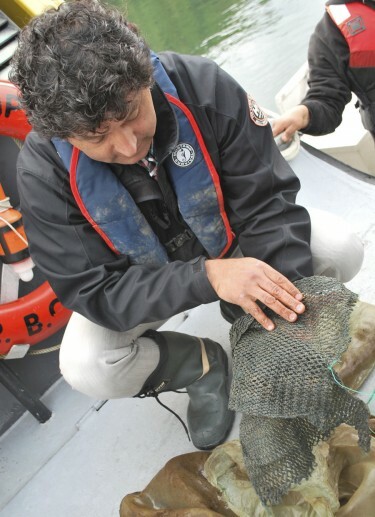 These small ocean fish return to the estuary at the end of every winter and, while their lack of commercial value means little research has been undertaken, their value to the area’s First Nations people is immeasurable. To this day eulachon are an important part of indigenous communities’ diets. 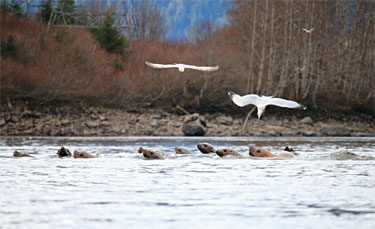 The eulachon run attracts other species like sea lions and gulls to the Skeena River to feed. Photo credit: Allison Paul. Penny talks with fishermen and elders along the river to get an estimate of the eulachon run, how much each person harvests, who they are fishing with and how long it takes fishermen to get enough fish for themselves and those they share with. 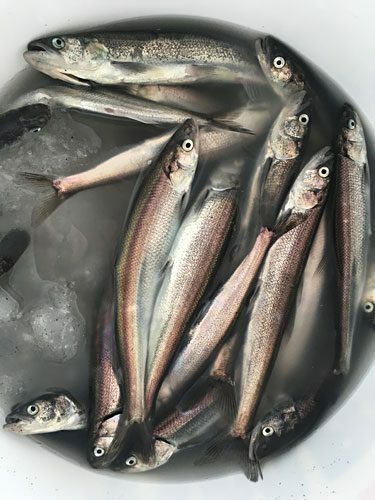 A bucket of eulachon on ice. Photo credit: Penny White. MaPP identifies the importance for First Nations to have access to traditional foods and recognizes the value of protecting the variety and quantity of marine resources for First Nations use. It considers data on food security needs and First Nations use when selecting areas for protection. “Food security is a big issue our Nations are facing and it’s a priority for NCSFNSS,” says Penny. The best way to understand the cultural, biological and economic importance of the Skeena Estuary is to get to know it. After a short visit, you may become inspired to participate in efforts to enhance stewardship of this truly unique coastal habitat to ensure future generations can enjoy all that it has to offer. 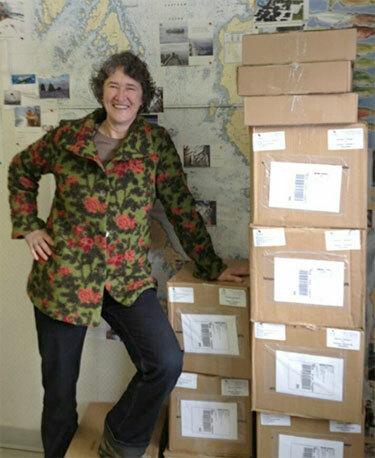 NCSFNSS fisheries biologist Penny White. Photo credit: Penny White. Maya Paul, North Coast cumulative effects coordinator. Photo credit: Maya Paul. Growing up in the rolling savannah of Botswana in southern Africa, Maya Paul could never have imagined that she would one day find herself living amid the rain forests of British Columbia’s north coast. Yet that’s exactly where her expertise in strategic planning and engagement has led her. 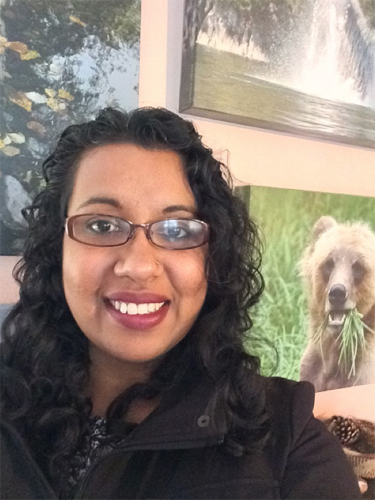 In January 2016, Maya was appointed cumulative effects coordinator for the North Coast MaPP sub-region, working on behalf of both the North Coast Skeena First Nations Stewardship Society and the Province of B.C. “My role is to coordinate the collaborative development and implementation of a MaPP cumulative effects framework in the North Coast,” she says. 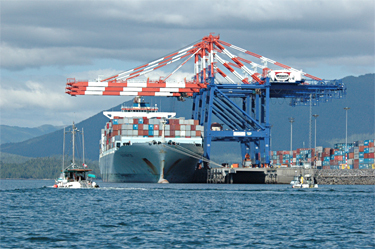 Container traffic in Prince Rupert has increased at a faster pace than any other North American port. Photo credit: Maya Paul. Cumulative effects are changes to environmental, social and economic values that are caused by the combined effects of past, present and reasonable foreseeable actions or events. Maya has the task of coordinating the development of a framework that accounts for changes to core marine values from human activities on a large stretch of coastline in northern B.C. that includes First Nations communities and the bustling hubs of Prince Rupert, Terrace and Kitimat. Development is being proposed at a rapid pace in the region and Paul hopes to pinpoint the major concerns of coastal communities around effects on core values from the rush of new projects, several of which are still in the midst of environmental assessments. Understanding core values is a key component of cumulative effects assessment. Photo credit: Birgitte Bartlett. The theme of sustainability has been a major driver in Maya’s life since she left Africa and attended the University of Guelph in Ontario where she earned a Master of Science in Environmental and Resource Economics. She also holds a Bachelor of Science in Environmental Science. Calculating cumulative effects in marine ecosystems is challenging because values and impacts often cross jurisdictional boundaries. Photo credit: Allison Paul. Natural resources of the North Coast have high cultural significance to the residents. Photo credit: Maya Paul. Chief Sm’ooygit Niist’oyx, or “Grandfather Handshake”, is a hereditary chief of the Gitwilgyoots tribe, one of the nine allied tribes of the Coast Tsimshian who live near the lower Skeena River on B.C.’s north coast. His given name is Clarence Nelson. 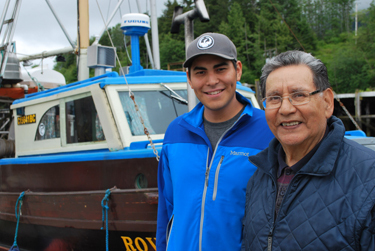 He is a traditional and commercial fisherman, a member of many community committees and a well-read lover of local, First Nations and maritime history. He is also proud to be a mentor of young people who are interested in learning to fish for a living. Since before contact, Nelson’s people have lived in the region close to what is now known as Prince Rupert. Every summer they travelled to prime fishing and hunting grounds and returned to the village of Metlakatla for the winter. “Metlakatla had its own First Nations name –Tbuunom Galtsap. It means ‘place of plenty’. When you lived there you never ran out of food,” Nelson says. Today the resources provided by the land and the sea are still very important to the First Nations people of Metlakatla. Nelson says marine planning helps to identify the type and location of the different sea resources and habitats and which ones might require protection. 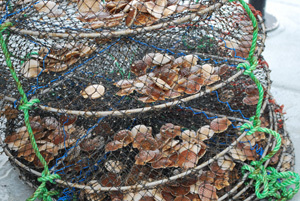 He refers to abalone, which hasn’t been harvested for many years. “My grandchildren haven’t had a taste of abalone. They can only see it in a picture. And if we don’t manage the rest of the resources, that’s what’s going to happen to everything,” he says. It is a challenging and changing time for young people on the North Coast. As new developments bring different opportunities, it’s even more important to remember and protect the traditional way of life. “We’re trying to find a happy medium where we can take advantage of future opportunities and keep on going with what we’ve been doing for generations,” Russell says. 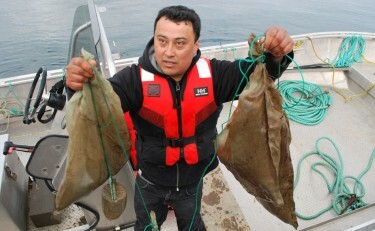 Shellfish farm production manager, Leo Vargas, with bags of scallop spats, also known as settled larvae. Canadian waters, Chilean technology, and First Nations and Chinese investment are all contributing to the success of the Coastal Shellfish Corporation in Prince Rupert. With a modern shellfish hatchery built in Prince Rupert and a shellfish farm in Metlakatla traditional territory, Coastal Shellfish hatches, grows and harvests scallops with minimal environmental impact. Originally planned as an economic development opportunity in 2003, the hatchery launched as a pilot project in 2011 and had a few growing pains before its current success. Coastal Shellfish is now on track to becoming one of the biggest shellfish aquaculture operations in B.C. Operations vice president, Vittorio Venturini, checks scallop spats on setting nets. Operations vice president Vittorio Venturini says that the water quality of the North Coast provides a huge advantage. “Up north, conditions are very good for shellfish farming. We have oceanic water coming in so that’s a good reason to have our farm here.” The challenge, he admits, is that logistics are harder to manage far from a large population base. But the company has a state-of-the-art hatchery in Prince Rupert, farm sites in Metlakatla territory, and plans to be processing scallops in Prince Rupert late this year. The scallop production cycle target is 24 months or less. 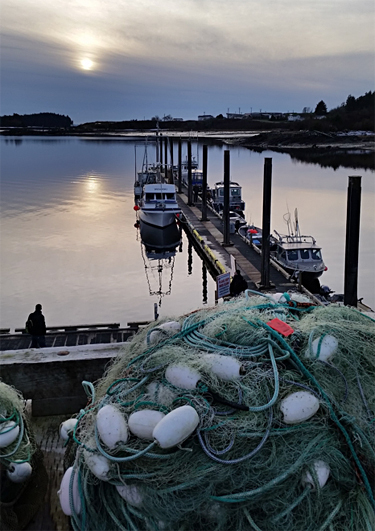 With its partners – the Metlakatla First Nation, the Coastal First Nations through its Great Bear Initiative and (Chinese) Canada Blossom – Coastal Shellfish expects to create 50 to 60 new jobs within the next few years. Coastal Shellfish plans to farm other species as well – perhaps geoduck and sea cucumber. “We’re already making some trials with other species,” Venturini says. 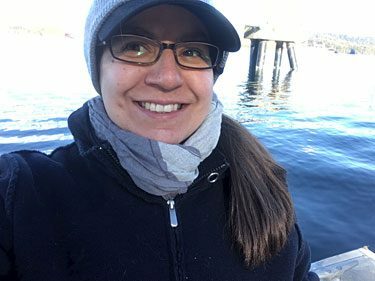 The co-director of the Cetacealab, a whale research facility on Gil Island, on the North Coast of B.C., is all too familiar with the mistakes that insensitive whale-watchers make. Wray and her partner Hermann Meuter have earned their knowledge of whales through years of observation. 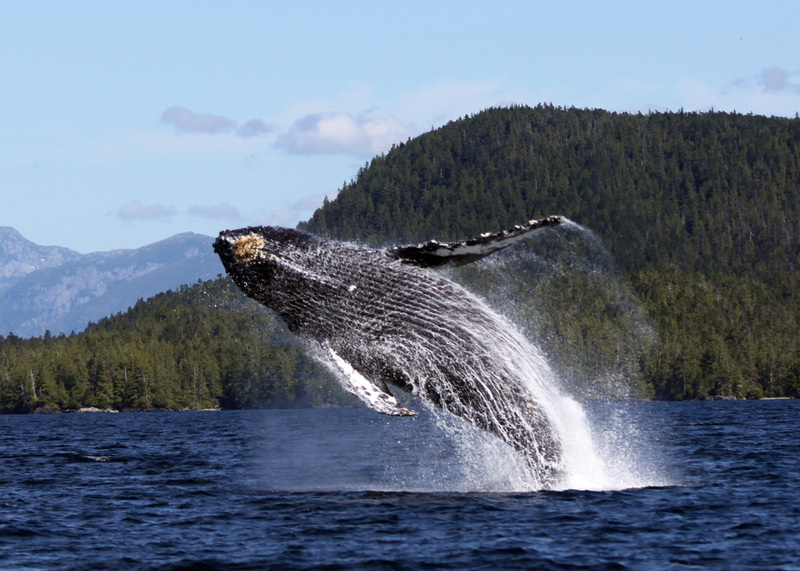 In the 1990s they worked at Orcalab, a land-based whale research station near Vancouver Island. 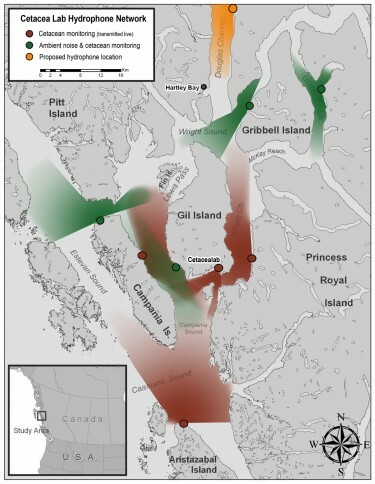 In 2001, they established their current research station, Cetacea Lab, within Gitga’at territory on the North Coast. “Chief Johnny Clifton loved the idea of there being a whale research station in their territory,” Wray recalls when describing the early days in which she and Meuter had to camp, in the rain. Now that the two have built their own facility, along with a place to live, they have eight listening stations set up throughout the area. Each station has a hydrophone – an underwater microphone – allowing them to record the sounds of whales, and just about anything else. The hydrophones, which can cost as much as $10,000, are set up to run on solar- and wind-power batteries. A veritable encyclopedia of whale information, Wray says there are roughly 250 northern resident killer whales, 300 transient killer whales and about 2,000 humpbacks along the B.C. coast, with more than 300 whale observations recorded by Cetacea Lab. But the most exciting development for her has been the relatively recent appearance of fin whales. “We didn’t see our first fin whale until 2006,” she recalls, “with only a few sightings per year until 2010.” Now, she’s lucky enough to see a fin whale almost daily and she remains awed by their impressive size – up to 70 feet long. This makes them the second largest animal on the planet, next to the blue whale. A strong believer in marine spatial planning, and a member of the MaPP North Coast Marine Plan Advisory Committee, Wray says her involvement in this group has taught her the importance of listening to others, even those with conflicting views. Her role remains clear: by sharing her knowledge of whale distribution and behaviour, she wants to ensure that whales have good human experiences.